cool i am first to say a comment. okay i really like them like bobbly head aliens hahaha that's so cool. my week end was sorta relaxing, except that i had to baby sit my two cousins till 2:30 in the morning, because my aunt and uncle were at a party. *sigh* but i had fun, i watched Emma and When A Stranger Calls. it was really fun, by the way everyone should try ( if you haven't already) Chunky Monkey and Rocky Road Ice Cream from Ben and Jerry's. they are both really good! Gosh I wish my sundays were that interesting. All I did was babysit my brother and then eat wonton soup and some crappy wontons at some asian resturant. 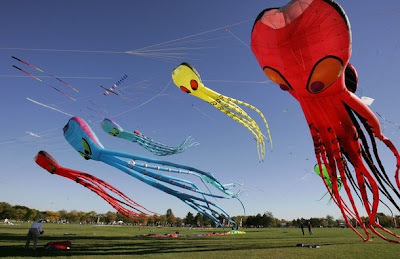 Funny, but when I first saw the picture, I actually thought that those were real flying squid things..........I love this website. I...went to church, had my cello lesson, and ate Pop-Tarts. That's about it for me. Cewl! Flying alien squids! Were you at a balloon fair or something?? Capturing crooks, battling evil, eating tacos. The usual. That is a fab pic! Oh my good sweet heezy facheezy!!! I want one of those squids!!! My sunday was a complete lazy day. It was pretty awesome. I started reading Pride And Prejudice And Zombies. Great book. I spent my Sunday being hopelessly unproductive. i just realized something. Kristen, i saw this really cool documentary in orchestra a few weeks ago. i usually don't like documentaries, but i really liked this one. The name of the movie is Man On Wire, and it is a documentary on these french men and women who decide to put a rope between the twin towers and have a man walk across the rope. yes it is a little old, but it looks new, and the actual people tell the story, and they are very energetic and make you want to listen and they do reenactments and they show actual videos of them. it was really cool and it sorta reminded me of the irregulars, you know, sneaking around, doing cool and dangerous stuff, and enjoying it! you should really see it!!!!! awww.. y was ur sunday hectic? i had a good time eating coffee flavored icecream and boating with my aunt. Ummm...I woke up and had lunch...I read...I had dinner...I read...I went to bed...I read under the covers with a mini flashlight till 11 PM...I fell asleep.